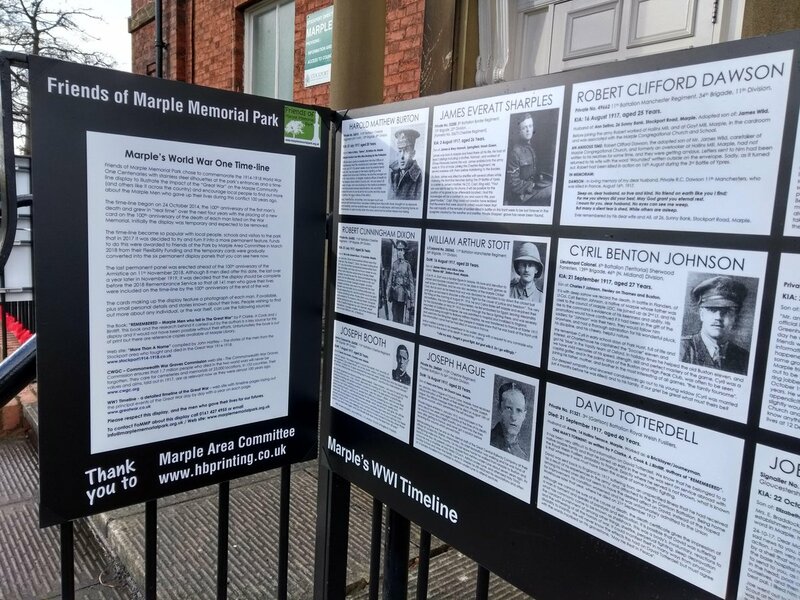 Just as a matter of interest, were there any Marple women serving as nurses, ambulance drivers, etc., overseas? And were any of them killed or injured either on land or in hospital ships, which the German Navy considered fair game - eg "Britannic" the first hospital ship to be sunk by enemy action. Allied hospital ships were clearly marked wth either the Red Cross or Red Crescent depending on which theatre they were serving. And there were also women killed and injured in munitions factory disasters such as the one in Ashton under Lyne in 1917. Were any of them Marple "girls"? This thread and the timeline in the park are specifically about the 141 men named on the war memorial in the park. 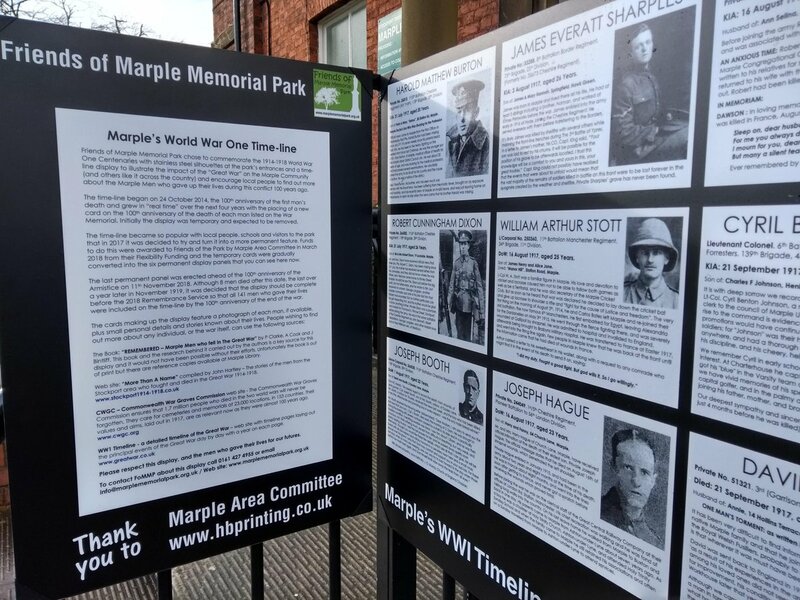 Having said that, I'm not aware of any women from Marple who served overseas or were killed as a result of the conflict. If there were any it would be great to have the details. 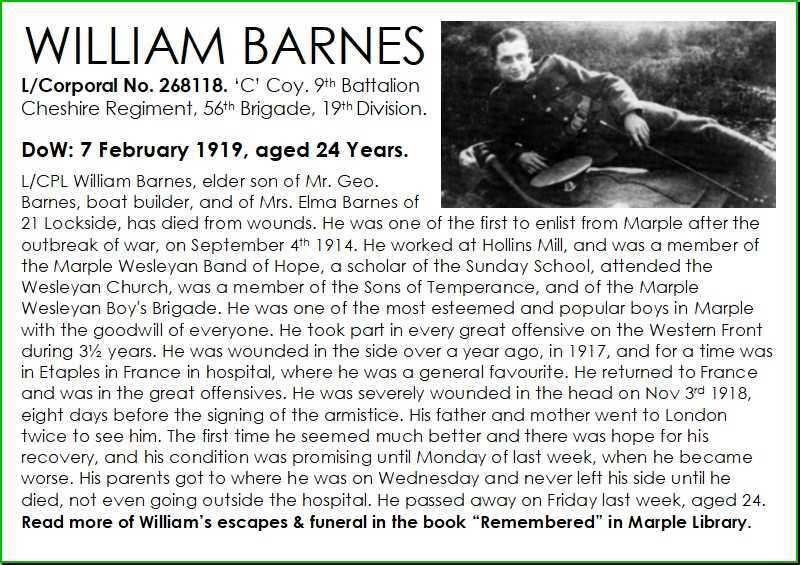 100 years ago today William Barnes became the 139th Marple man to die as a result of WWI. 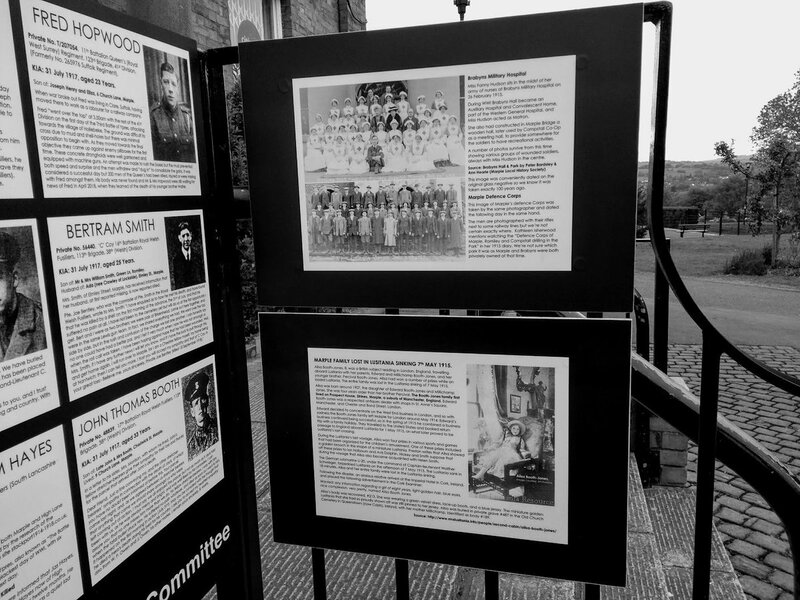 William's card was added to the timeline in the park on 1st November, so that it was displayed for Remembrance 2018. William was one of the first to enlist from Marple, on 4th September 1914. He took part in every great offensive on the Western Front and was wounded in the side in 1917. he recovered from this and was back in France when he was severely wounded in the head on 3 November 1918. After a lengthy recovery period he seemed to be getting better but then deteriorated again. His parents never left his side during the final few days and he slipped away from them on 7 February 1919, aged 24. 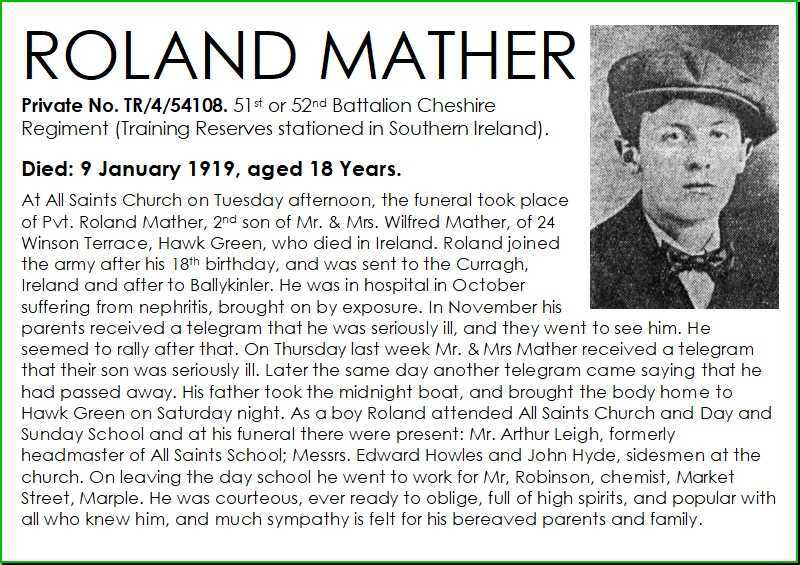 100 years ago today Roland Mather became the 138th Marple man to die during WWI. 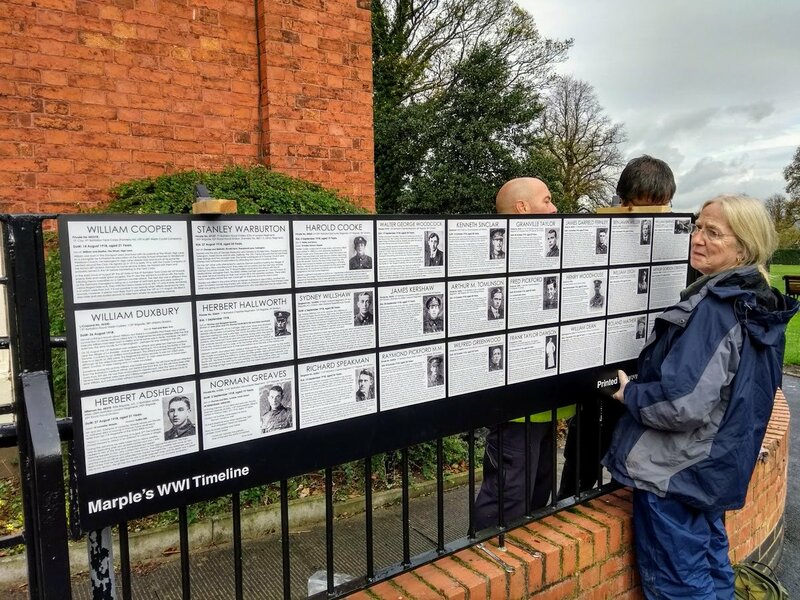 Roland's card was added to the timeline in the park on 1st November, so that it was displayed for Remembrance 2018. Roland worked at a chemists on Market Street but the war was still in progress when he became 18 and he was conscripted into the army. He was undergoing army training in Ireland but was taken ill in October 1918. This was reported to be nephritis brought on by exposure. He was still in hospital when he died nearly three months later. 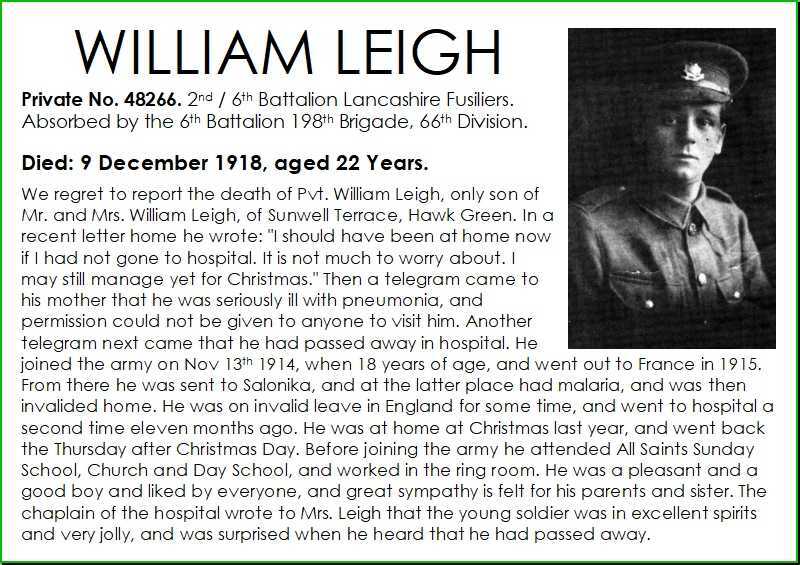 100 years ago today William Leigh became the 137th Marple man to die during WWI. William wrote home "I should have been at home now if I had not gone to hospital. It is not much to worry about. I may still manage yet for Christmas." But that was not to be and he died of pneumonia shortly after with nobody being allowed to visit him. 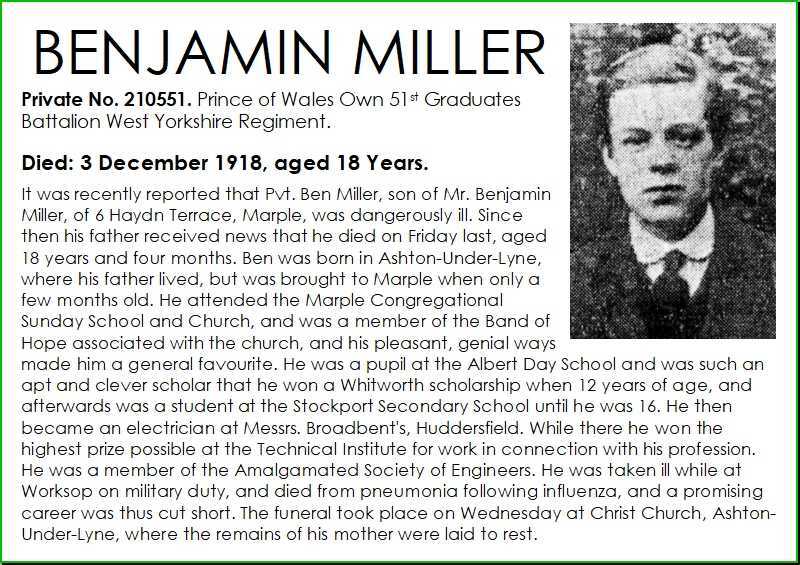 100 years ago today Benjamin Miller became the 136th Marple man to die during WWI. Benjamin began his education at Albert Day School but then won a scholarship to attend Stockport Secondary School. He died of pneumonia following influenza while on military duty at Worksop and a promising career as an Electrical Engineer was cut short at the age of 18. The similarities between the photos of Ben and Arthur Tomlinson (KIA 13 October 1918) are remarkable. 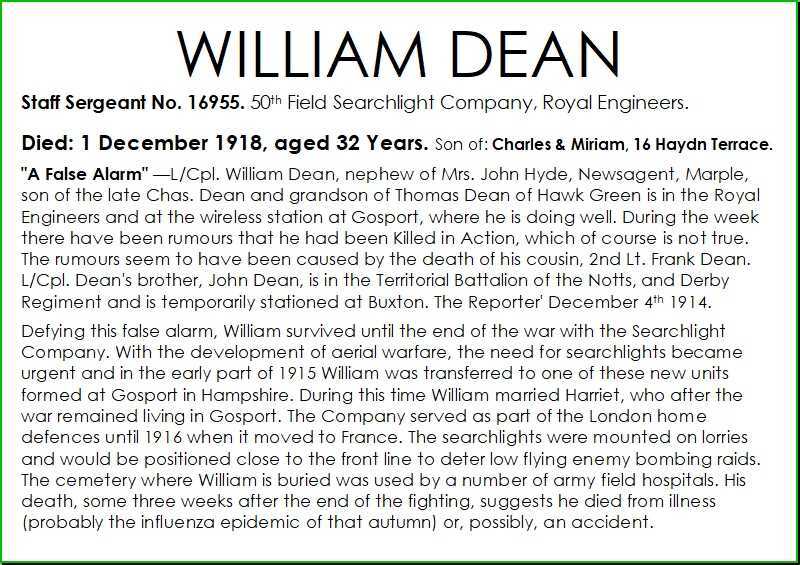 100 years ago today William Dean became the 135th Marple man to die during WWI. William was the subject of a false alarm when his death was reported in 1914, probably caused by the death of his cousin. He defied this false alarm until 3 weeks after the war ended, probably dying of influenza or possibly an accident. 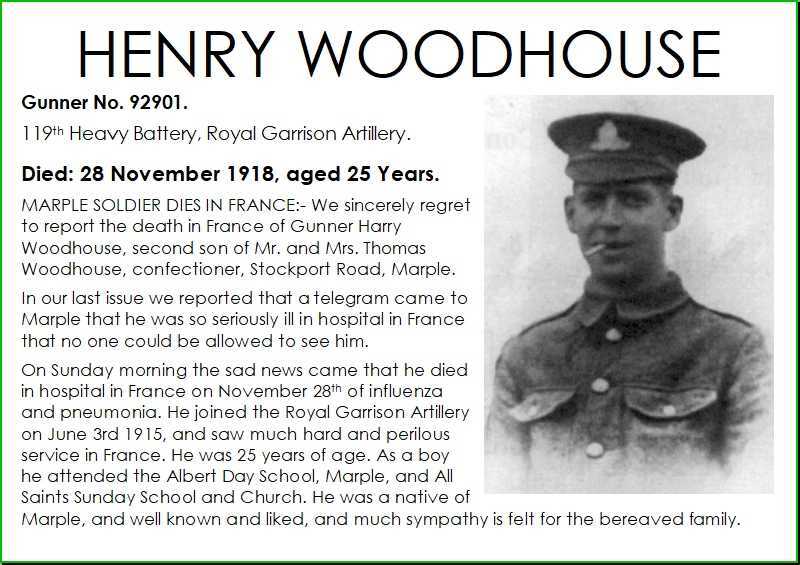 100 years ago today Henry Woodhouse became the 134th Marple man to die during WWI. 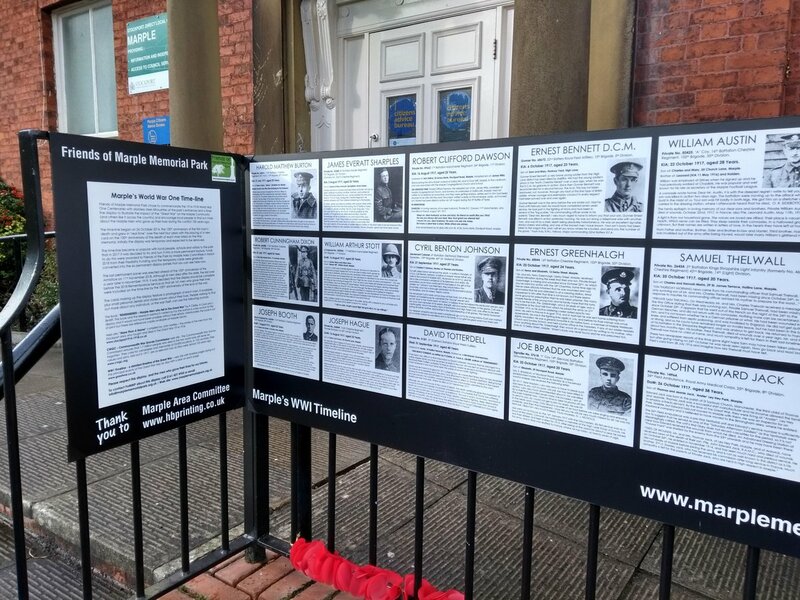 Henry's card was added to the timeline in the park on 1st November, so that it was displayed for Remembrance 2018. Henry's parents ran a confectionery shop on Stockport Road. They received a telegram saying that he was seriously ill in hospital in France and no one could be allowed to see him. On 28th November Henry succumbed to influenza and pneumonia while still in France. 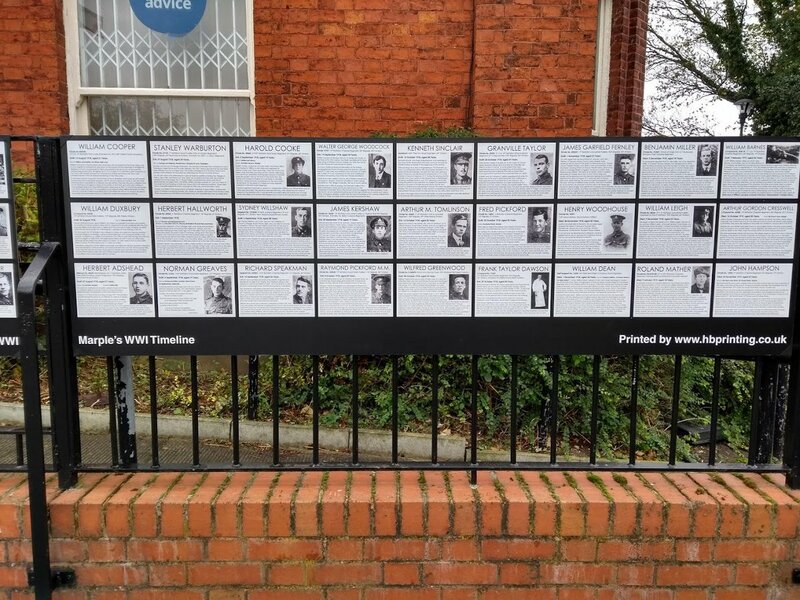 Today a small panel was installed on the Marple WWI Timeline to explain the background to the display and acknowledge information sources. The project is now complete except for announcing 100th anniversaries of the last 8 men when they fall. 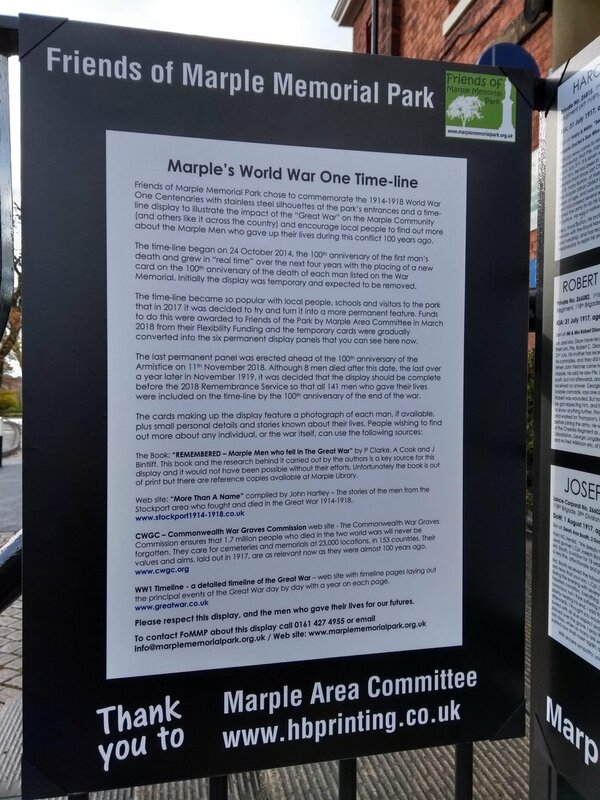 Marple's WWI Timeline display is now complete. 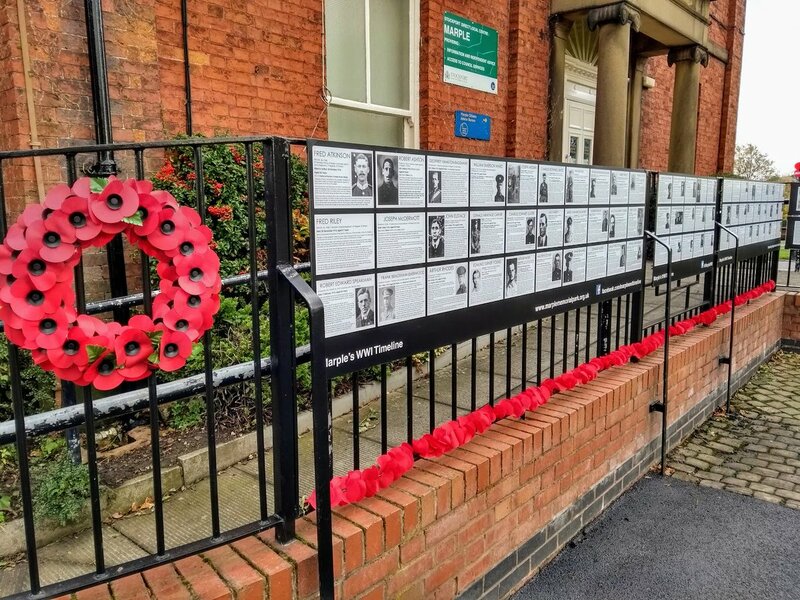 The final permanent timeline panel has been installed today and now all 141 men listed on the Marple War Memorial are on there in time for Remembrance. The 8 men whose 100th anniversaries have not yet been reached are also now featured. Thy will continue to be announced via the web site and social media on their 100th anniversaries until the last man in November 1919. There is one more small panel explaining the display and acknowledging information sources to be added, hopefully next week. 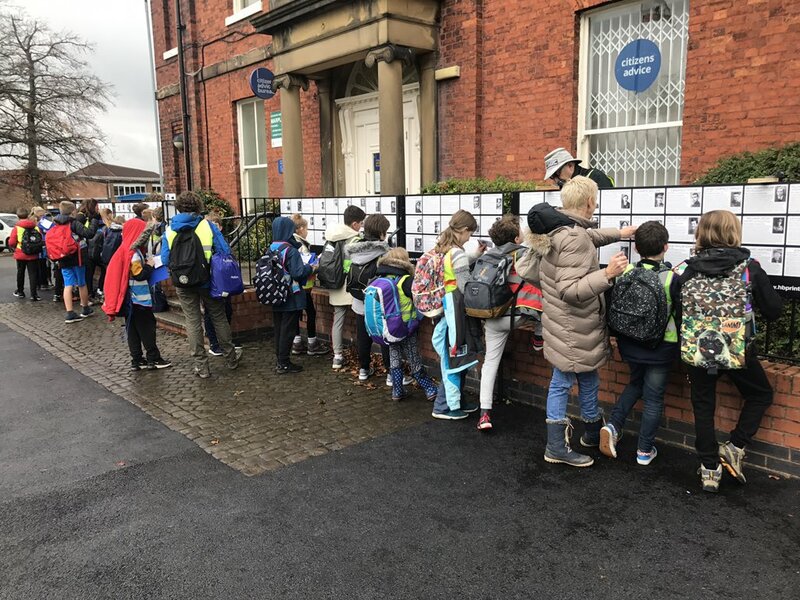 It was great to see dozens of children from Mellor school using the timeline to complete their "Who Was I?" cards when we arrived to install the panel with HB Printing. 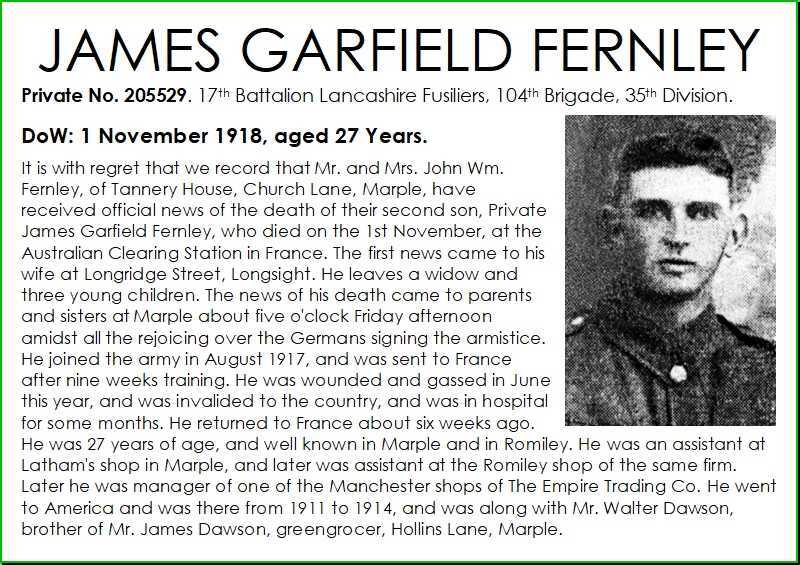 Friends of Marple Memorial Park's WWI Timeline Tribute display in the park has been updated with information about James Garfield Fernley. The news of James's death came to his family amidst rejoicing over the Germans signing the armistice. He left a widow and 3 young children. 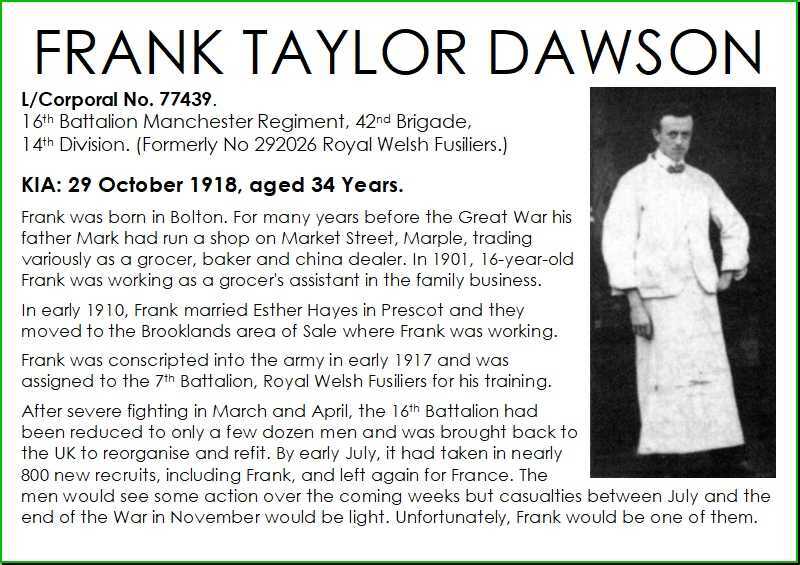 Friends of Marple Memorial Park's WWI Timeline Tribute display in the park has been updated with information about Frank Taylor Dawson. Frank's father ran a shop at 29 Market Street for many years (where the dry-cleaning shop is today). Frank worked there as a boy, so was well known. 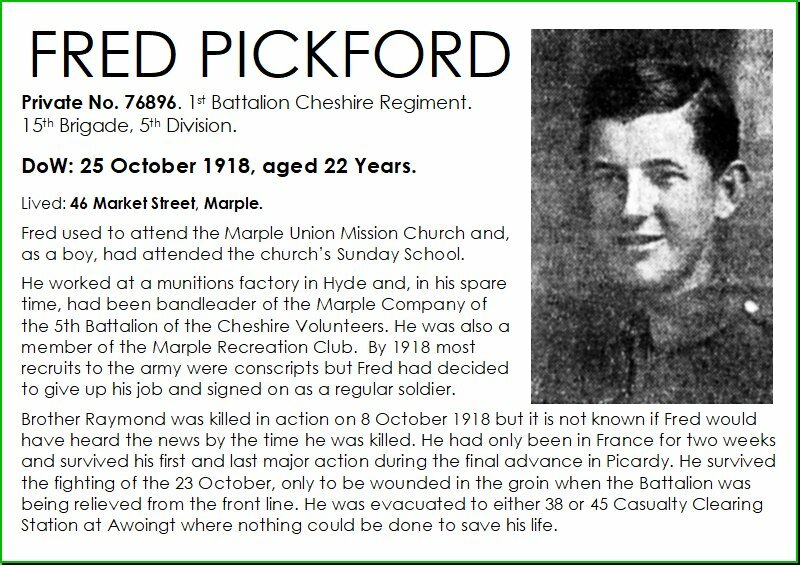 Friends of Marple Memorial Park's WWI Timeline Tribute display in the park has been updated with information about Fred Pickford. Fred's brother Raymond was killed two weeks earlier but it's not known if Fred would have heard the news before he was killed himself.